Coasteering – climbing up rocks, then jumping off into water – originated in the UK. I saw it on a trip to Cornwall and thought it would be a perfect activity for our amazing coastline of the southwest. 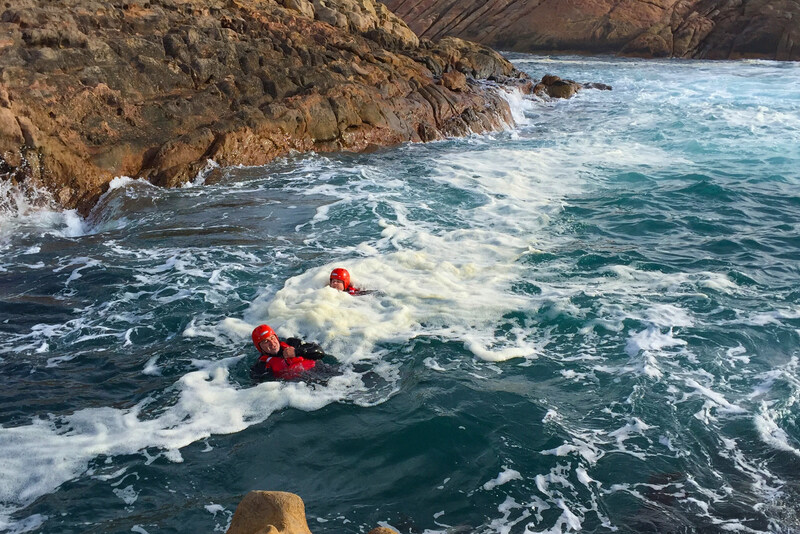 I get asked lots of questions about coasteering, so here are five things to whet your appetite before you don your wetsuit, helmet and lifejacket and jump…..
Coasteering definitely falls under the try something different category. Have you ever walked to the end of a beach and seen something you want to check out – another beach or a cave – but couldn’t get there because of the ocean? Coasteering is the act of reaching these otherwise inaccessible stretches of coastline, such as steep sea cliffs, caves and ledges. It’s also immensely enjoyable. You’re experiencing the coast in an utterly new way, and you’re doing it by jumping, splashing, belly-flopping and floating. 2. 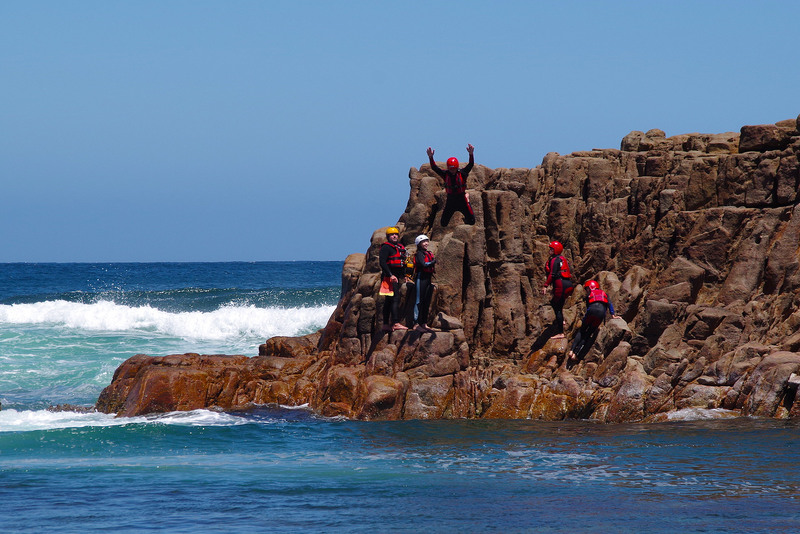 It’s the only coasteering adventure in Australia! 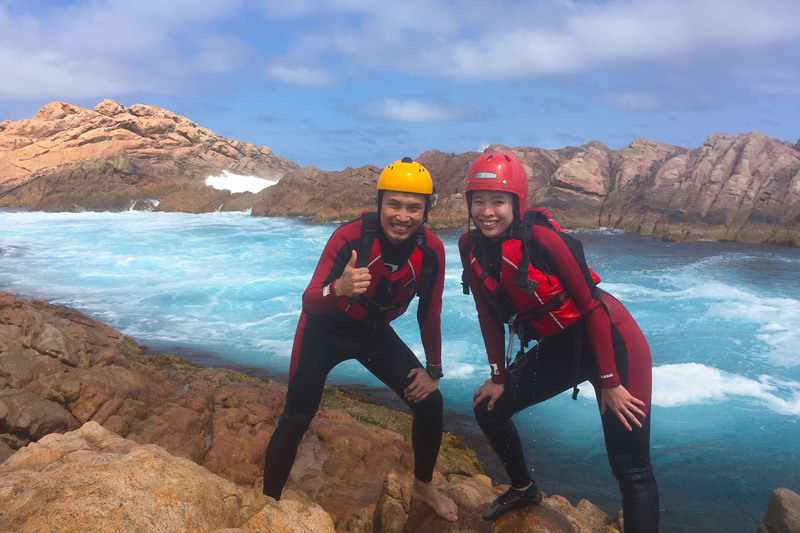 The stunning coastline of Margaret River makes it a perfect venue for coasteering, and we are the only tour company in Australia that does it! I originally saw it in many places around the UK, particularly Cornwall and Wales. No government authority understood what coasteering was, they’d say “you want to do what? !” No other part of Australia can boast such a diversity of marine landscapes; white sandy beaches that shoot up into towering granite sea cliffs, with limestone reefs that channel through to spectacular bays with dramatic rock stacks and sea caves. Jumping off cliffs? Floating across reef platforms? Anyone could do that by themselves, right? Wrong. It’s highly advised to do coasteering as part of an organised tour with someone who knows the local area and the ocean conditions. 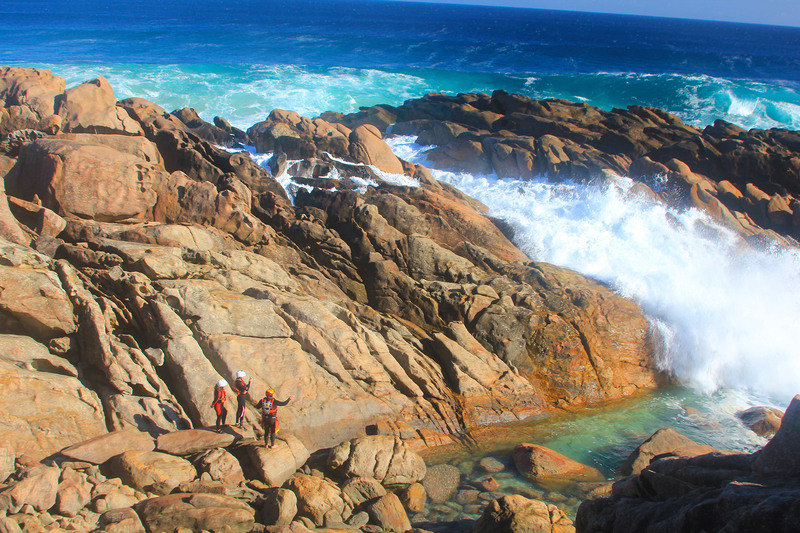 The Margaret River Adventure Co was instrumental in pioneering coasteering as an outdoor pursuit and it took years to establish our tried-and-tested routes. Experience counts, and a newcomer will never really know what’s what. Some of the coast looks harmless enough, but could be dangerous if you are unprepared. 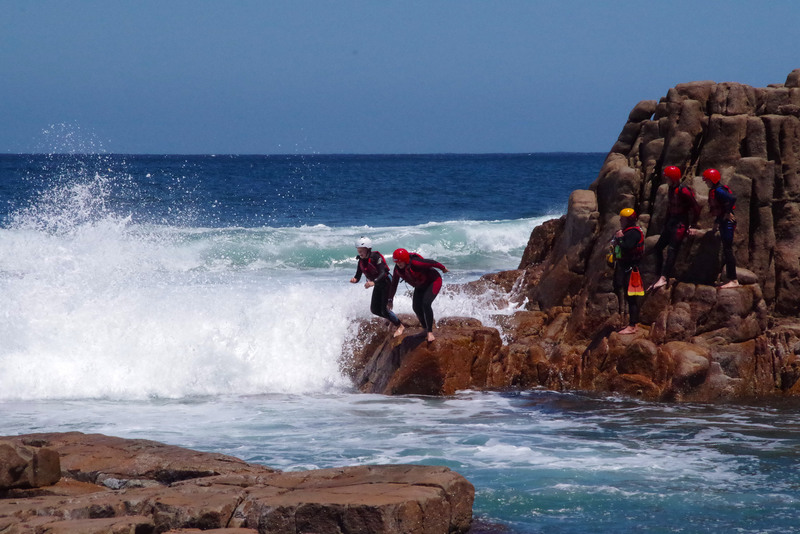 Equally, parts may appear daunting, but can easily be climbed – so it’s best to go with a guide trained in surf rescue. 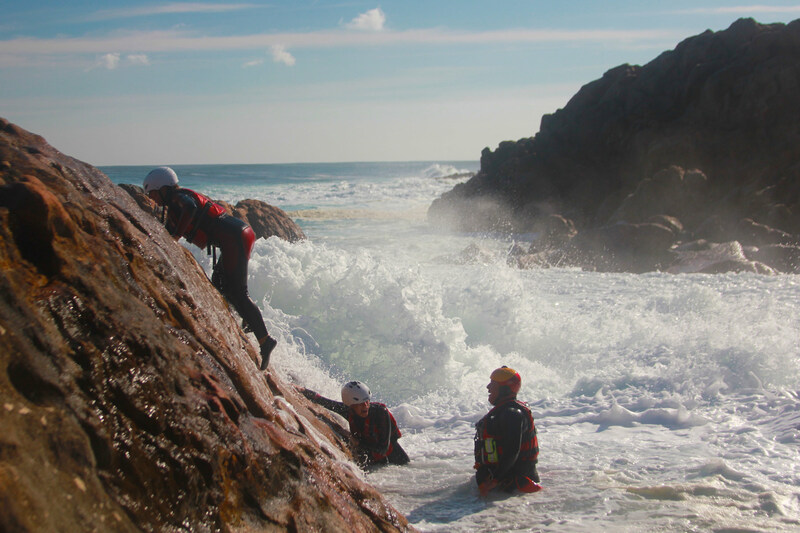 Coasteering with others not only makes the experience more fun, but also means there are the numbers to help out should anyone get into difficulty. A decent coasteering session takes about 3 hours, so you’ll want to be warm and safe during the activity. You’ll be given a long armed, long legged wetsuit, rubber shoes, a life jacket AND a helmet to keep you safe. The wetsuit and helmet will stop any rock or reef scratches and stop you donnging your head, whilst the lifejacket will keep you bobbing about like a cork in the surf! Coasteering is an activity for everyone, of every ability. We devise each tour with safety as our outmost priority and will cater to every persons skills. You only need to be able to swim 25m unaided. The rest is in your head.